This Tank Powerpoint template features a tank which is a large type of armored fighting vehicle with tracks, designed for front-line combat. Modern tanks are strong mobile land weapons platforms, mounting large-caliber cannon in a rotating gun turret. They combine this with heavy vehicle amour providing protection for the crew of the weapon and operational mobility, which allows them to position on the battlefield in advantageous locations. These features enable the tank to have enormous capability to perform well in a tactical situation. In both offensive and defensive roles, they are powerful units able to perform all primary tasks required of armored troops on the battlefield. 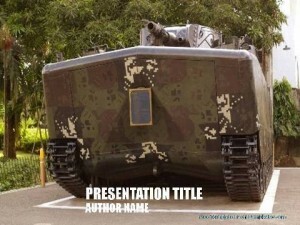 This free Army PowerPoint template features a live picture of a tank in its camouflaged print set amidst a background of trees. This Military tank powerpoint has image of a tank which can be seen in all the Officers Training Academy (OTA), across the country. The template can be used in history classes to teach students about the different weapons that were used in war. 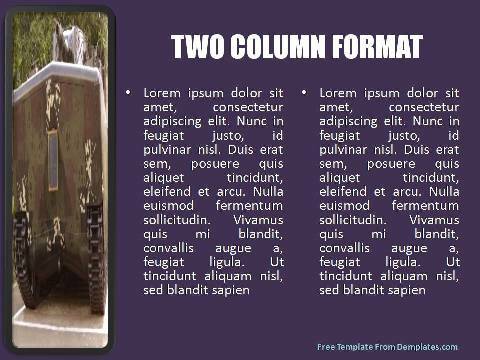 The Army, Military and Para Military academies can use this template and with live demonstration show the use and working of a Military Tank.